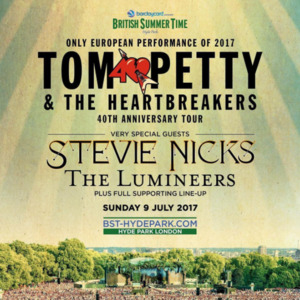 The sixth and final sold-out show of this year’s Barclaycard presents British Summer Time Hyde Park was headlined by the legendary American rockers Tom Petty and the Heartbreakers. This was the band’s only European date of 2017, which came to London as part of their 40th Anniversary Tour. This was also only the second time Tom Petty and the Heartbreakers have ever played in the UK in nearly two decades. It was the show loyal fans in Europe have been waiting for, as the band lit up the stage performing massive numbers from their 40-year career, which has to date sold over 80 million records worldwide. With that, the band wasted no time launching into their extensive back-catalog, blasting highlights to an ever eager crowd like, their signature hit Free Fallin, Don’t Come Around Here No More, I Won’t Back Down, You Don’t Know How It Feels, Mary Jane’s Last Dance, Refugee and Learning to Fly. Much to the delight of festival goers, Tom brought out “honorary band member” Stevie Nicks for a special performance of Stop Draggin’ My Heart Around. There were also fully-charged performances of newer material like Forgotten Man, from their latest album Hypnotic Eye, showing the band still has plenty of ammunition for the future. It was a day for music lovers - delivering a credible mix of outstanding singer-songwriters, rock, folk, country and blues musicians unlike any other in the festival’s history. The crowd erupted into deafening cheers when the iconic Stevie Nicks graced the Great Oak Stage. One of the most influential rock artists of our time, Stevie has sold over 140 million records worldwide as part of Fleetwood Mac and as a solo artist. Sounding as strong as ever and joyful to share this moment with her UK fans, she weaved seamlessly between her own solo cuts and Fleetwood Mac’s hits like Dreams and Gold Dust Woman (from the Rumours album, which celebrates its 40th anniversary this year), Landslide, Rhiannon and Gypsy. Stevie opened with Gold and Braid, a fan favorite from the Bella Donna sessions. The set list that followed was stashed with gems from pockets of Stevie’s long career, including stompers like Edge of Seventeen and Stand Back, Wild Heart, which had not been performed on stage since the 80s, and Moonlight, her Twilight-inspired song. There was also a performance of Crying In The Night, from Stevie’s album with Fleetwood Mac bandmate Lindsay Buckingham. Stevie shared with the crowd the inspiring story behind the record, which she wrote when she was working as a waitress in the early 70s. This might be the biggest audience American folk rockers The Lumineers had performed to in the UK but the crowd did not need much convincing as they sang and clapped along enthusiastically to international hits like Ho Hey and Cleopatra. The Grammy Award-nominated band also delivered hearty performances of their stand-out tunes Charlie Boy and Gun Song, which were sure to win over any discerning folk music fan. Blues band The James Hunter Six got the day started on the Great Oak Stage with plenty of soul, followed by The Shelters who injected a dose of rock and roll energy into the sun-kissed crowd. The band performed material from their debut self-titled album, which was co-produced by Tom Petty himself. There was a tour-de-force of talent pouring out of every stage today. Country music duo Ward Thomas shone on the Barclaycard Stage performing songs from their hugely successful new album Cartwheels, which became the first album by a UK country act to reach #1 on the UK Album Charts. Modern Americana band The Head and the Heart also hit the stage - driving home an unmissable set for fans of Americana. Meanwhile at the Summer Stage, festival goers enjoyed a laid-back Sunday in the sun with good food and great tunes by emerging talents like soul troubadour Jordan MacKampa and country pop singer Catherine McGrath. Stars such as Rosanna Arquette, John McEnroe, Shania Twain, Gillian Anderson, Olivia Harrison, Jennifer Saunders, Glyn Johns (legendary producer for the Rolling Stones), Sharon Horgan, Holly Willoughby, Alan Carr, Laura Whitmore, and Lady Amelia Windsor flocked to the last day of the festival to catch the music greats today. 2017 marks the fifth year of Barclaycard presents British Summer Time Hyde Park. This year’s line-up included: Phil Collins (6/30), Green Day (7/1), Justin Bieber (7/2), Kings of Leon (7/6), The Killers (7/8) and Tom Petty and the Heartbreakers (7/9).